They are also self-healing(more later)! The mouse muscle fiber grew from progenitor satellite cells which exist in mature living muscle. The trick, according to the Duke researchers, required finding “the perfect environment for muscle growth” for the satellite cells. Specifically they needed “well-developed contractile muscle fibers” included in the mix with the immature cells. 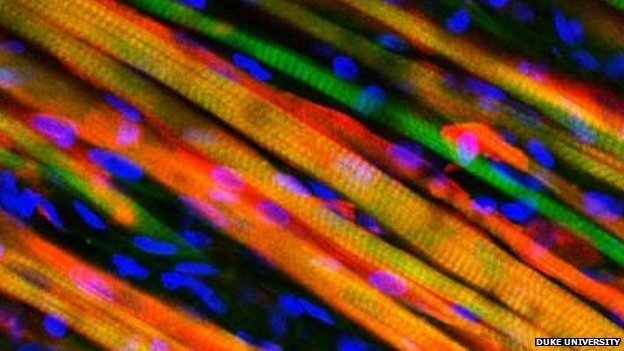 Once the cells grew into mature fibers themselves, they were grafted into mice where the new muscle adapted function and strength. As for self-healing, an ex vivo study in which new-grown fibers were damaged by toxin, they recovered contractile function after being re-exposed to the milieu of immature cells. Seeing Green for One Thousand Miles…and Counting!